Meskipun menggunakan nama Illinois, jangan berharap dulu kalau band ini berasal dari Amrik, Justru Band Brutal Death Metal dengan sentuhan Teknikal Part dan Slam Breakdown ini malah berasal dari Chelyabinsk region, Russia yang menampilkan duo proyek berbahaya coy !! menampilkan komposisi yang " Fresh " bagi Slam Death Metal movement yang teknikal, struktur musik band ini wajib untuk menjadi santapan setiap hari. Russia sendiri memang menjadi Scene movement dengan perkembangan pesat Genre ini, sehingga kadang gw berani memastikan sekali konsep yang mereka tawarkan slalu menjadi jaminan BERBAHAYA !! surprise banget saat pertama kali mendengar lagunya yang mengangkat lirik humor dan Reality ga seperti kebanyakan band slam lainnya dengan anyir amis bau darah, Illinois' Love for Carnage malah lebih simple dengan gaya " Sosial " nya ini hehehe ... tapi sayang keberadaan band ini serba misterius, karna gw mencari kesana kemari informasinya, gw hanya menemukan logo dan artwork-nya saja, padahal konsep musik band ini keren loh ! one of the go-to bands if you're trying to get into slam, and always tell you to listen to this album. This is supposed to the epitome of slamming brutal death metal. I'll never understand why it is so commonly cited as such. 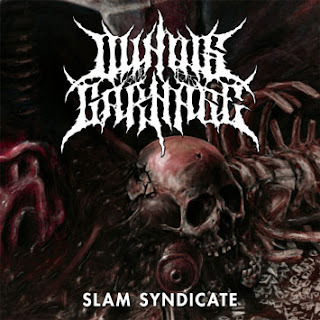 It's pretty dull and repetitive, even by slam Technical Dynamic Brutal Death Metal ! ... mungkin band ini mengalami Evolusi baru setelah materi 4 lagu demo-nya lebih Kental terasa elemen Brutal Death Metal-nya in the Vein Suffocation dengan sentuhan slam tentunya harus semakin lebih mengalami Perubahan di 2 lagu baru terdepannya menjadi lebih dengan sentuhan Slam Groovy tanpa harus banyak melepas elemen Teknikal-nya. the slam influences coming pretty naturally to them ! track pertama " Gojira's Objections ", band ini memukau sekali dengan sayatan Downstroke Sweep Picking Riff-nya kemudian hentakan blastbeat yang cepat lengkap dengan Growling Vokill di Part awal dan kemudian siksaan Slam Part mulai terasa pada 1 menit pertama bareng sampling suara Monster Godzilla-nya, masih mengandung karakter konsep musik awal, konsepsional musiknya masih kental aroma Brutal Death Metal style ! , Salut untuk kerja keras mastermind Sasha Borovykh untuk menciptakan komposisi garang seperti ini. knew damn well that their music was as dumb as a sack of bricks and didn't really need to be connected in any logical fashion, so things sort of went like this: BRUTAL BREAKDOWN SLAMSLAM SUPERFASTBLASTYPART SLAMSLAM BREAKDOWN ENDOFSONG. Here, it feels like they're trying to be a bit more professional and presentable, and for what it's worth, I guess that'd be a pretty good description for it. But at the same time, the whole thing feels so goddamn pedestrian and safe as a result that it's really not worth paying any mind. Good Songs Good Sounds !!! lalu " ...of What's Turning? " banyak gw tangkap gaya bermain Baru Dying Fetus pada ketukan part awalnya. sebenarnya banget kalo gw cermati nih band lebih fokus pada konsep Brutal death Metal dengan Groove fantastis sekali, sehingga kalo gw kategorikan sebagai band slam terlalu naif banget mengingat sentuhan bermusik yang sangat kompleks mereka tawarkan disini. The guitar tone isn't really heavy enough for this maximize of brutal death metal; it's sterile and clean and incapable of actually offending people who are picky about extremes in terms of production, but at the same time it just feels rather dry, restrained and unfulfilling as a result. This lack of punch becomes especially evident in the technical deathcore tremolo riffs, which would normally be pretty powerful by sole virtue of being deathcore riffs, but they all come across as too full of treble and frustratingly indirect whenever they're played, as if they're flitting away from the listener's ear. pantas memang walau masih terkemas sebagai promo demo, Pihak Permeated Records nekad dan ngotot untuk merilisnya dalam format yang lebih degan kemasan Profesional dengan hanya menuangkan 6 lagu saja karena Memang potensi style band ini asli diatas rata2. who seems totally unconcerned with playing syncopated snare patterns of any sort and is content to blast where the music warrants it, play straight rock beats wherever that's basically what the music needs as a bare essential, etc. Drum rhythms play a lot larger of a role in good slam death metal than a lot of bands seem to realize and in the same way that blasting constantly over music sounds pretty boring, constantly vomiting over entire measures of music with no rests, fluctuations in tone, or major variations in style is going to get boring really quickly. YOU MUST TRY SLAUGHT THIS !!!! Although the name of Illinois, do not expect the first band that comes of the United States, precisely Brutal Death Metal band with a touch of Technical Part and Slam Breakdown is even derived from the Chelyabinsk region, Russia duo who show dangerous project coy!! show that the composition of "Fresh" for Slam Death Metal movement that technical, this band of musical structure required for a meal every day. Russia itself has become Scene movement with the rapid development of this genre, so sometimes i can assure you all that the concept of security they offer pobud be DANGEROUS!! surprise really when you first heard the song lyrics that lift and Reality ga humor unlike most other bands slam with rancid fishy smell of blood, Illinois' Love for Carnage even more simple in the style of "Social" it is hehehe ... but unfortunately the existence of this band completely mysterious, because i find information here and there, I just found the logo and artwork of his course, but the concept of the band's music cool loh! one of the go-to bands if you're trying to get into a slam, and always tell you to listen to this album. This is supposed to the epitome of slamming brutal death metal. I'll never understand why it is so commonly cited as such. It's pretty dull and repetitive, even by slam Dynamic Technical Brutal Death Metal! ... This band may be experiencing a new evolution of the material after his 4 song demo feels more elements Condensed her Brutal Death Metal in the vein of Suffocation with a touch of the slam should certainly be experiencing changes in its leadership into 2 new songs with a touch more Groovy Slam without having a lot off Technical elements of it. the slam Influences coming pretty naturally to them! first track "Gojira's objections", the band's mesmerizing once the incision downstroke Sweep Picking Riff him then beat blastbeat rapid complete with Growling Vokill in Part outset and then torment Slam Part began to be felt in 1 minute first with voice sampling Monster Godzilla him, still embodies the concept of early music, the music is still strong aroma conceptual Brutal Death Metal style! , Salute to the hard work of creating Borovykh mastermind Sasha fierce compositions like this. knew damn well that their music was as dumb as a sack of bricks and did not really need to be connected in any logical fashion, so things sort of went like this: BRUTAL BREAKDOWN BREAKDOWN SLAMSLAM SUPERFASTBLASTYPART SLAMSLAM ENDOFSONG. Here, it feels like they're trying to be a bit more professional and presentable, and for what it's worth, I guess that'd be a pretty good description for it. But at the same time, the whole thing feels so goddamn safe pedestrian and as a result that it's really not worth paying any mind. Good Songs Good Sounds!!! and "... of What's Turning?" many gw catching style of play New Dying Fetus on the beat part initially. i actually really if ya look at the band more focused on the concept of Brutal Death Metal with Groove fantastic one, so if i categorize as too naive slam band really given a very complex musical touch they offer here. The guitar tone is not really heavy enough for this maximize of brutal death metal; it's sterile and clean and incapable of actually offending people who are picky about extremes in terms of production, but at the same time it just feels rather dry, restrained and unfulfilling as a result. This lack of punch Becomes especially evident in the technical deathcore tremolo riffs, roomates would normally be pretty powerful by sole virtue of being deathcore riffs, but they all come across as too full of treble and frustratingly indirect Whenever they're played, as if they 're flitting away from the listener's ear. worth it though still packed as promo demo, Party Permeated Records desperate and determined to release it in a format that is more degan Professional packing with only 6 songs just pour Indeed, the potential for this band original style above rata2. who seems totally unconcerned with playing syncopated snare patterns of any sort and is content to blast where the music warrants it, play straight rock beats wherever that's basically what the music needs as a bare essential, etc. Drum rhythms play a lot larger of a role in good slam death metal than a lot of bands seem to Realize and in the same way that constantly blasting music over sounds pretty boring, constantly vomiting over entire measures of music with no rests, Fluctuations in tone , or major variations in style is going to get boring really quickly intervening. SLAUGHT YOU MUST TRY THIS!!! !